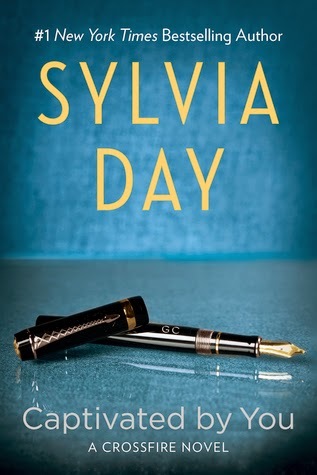 Well the question on everybody’s lips is “Was it worth the wait?” Well, I have to say personally I think it was, the release date was not Sylvia Day’s fault, it was the publishers so I cannot hold her responsible for that one and I hope that Book Five comes out a lot quicker than this one did. I did read this one without re-reading as I just didn’t have the time and I must admit I did not find it hard to get back into the swing of things. First and foremost, this book has Gideon’s POV and this was such a god send. To be honest nothing much really happens in this book but what it does centre on is Gideon and Eva working on their relationship which is something that they both badly needed to do. By having a dual POV I found that I was able to relate so much more to them as a couple. Gideon is still that dark enigma that always keeps himself to himself, but by letting us into his mind we do see a totally different side to him. He is extremely vulnerable, insecure, he has issues and fears that still need to be addressed but most of all he has finally found his achilles heel and to him, this makes the one solitary chink in his armour become a beacon for all his enemies. It scares him. Unfortunately that achilles heel is his all-consuming love for his wife, Eva, making her a prime target. Gideon will always be the protector, having been hurt himself and knowing Eva’s history, he feels that he has been put on this earth to protect her no matter what, his deep unconditional love for her sometimes clouds his judgement and he actions first and thinks later. It is this mentality that causes most of the friction in this book. Although Eva can see why Gideon does this, all she wants is to be included, which is not a hard ask. Gideon being the secretive and personal person that he is prefers to keep his cards close to his chest. Not knowingly keeping Eva out his thought processes, this is just the way he is wired, but this needs to change else there will be more trouble ahead. These two are extremely intense and this does not change throughout this book, their true connection when together is never more apparent than during the throes of passion and as usual, this couple need that connection a lot. Yes there are lot of those scenes, but I have to be honest and say I didn’t think it was too much. This is just the way their relationship has always been and I feel it is a mask for other hidden problems that are being addressed through therapy, so I can see them quietening a bit down in the future, but for now, this was typically Gideon and Eva. Sylvia Day never disappoints with these scenes and they were hot but most importantly they were emotional. So, I have given this instalment 4 stars, mainly because I felt it was lacking in solid content, but this was countered by what we learned about Gideon and what he is facing through therapy. There is still a lot of interference from outsiders, but this couple just attract that kind of drama and Gideon is doing his best to extinguish any threats before their embers become a full on forest fire. I have strong hope for this couple going forward. They are tackling their issues head on to make their relationship solid and this can only be a good thing, their love for each other never wavers and if anything only intensifies. I cannot wait to see these two finally get their HEA; after all, it has been a long time coming.